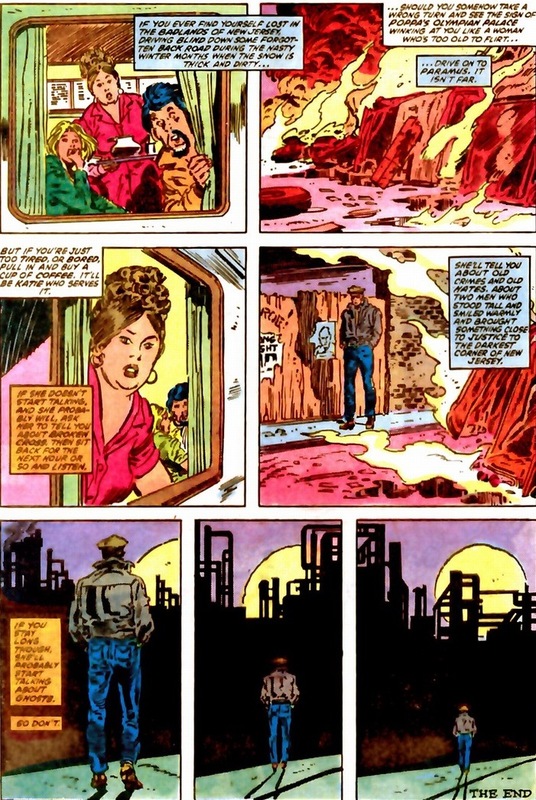 Thanks to a recommendation from my friend wwayne (who has a fantastic website if you’re fluent in Italian), I delved into some 1980s Daredevil. 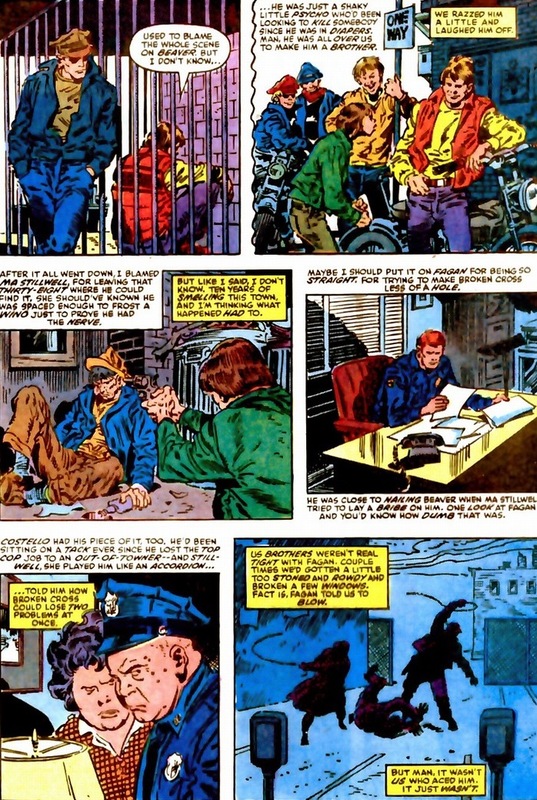 And while the story’s fantastic — which we’ll cover today — what really caught my attention is how similar Daredevil #219, written by Frank Miller & John Buscema and drawn by Gerry Talaoc, is to Daredevil: Reborn #1-4, written by Andy Diggle and drawn by Davide Gianfelice. Difference being over 20 years between when the issues came out despite the familiar plots, even right down to the name of the area. 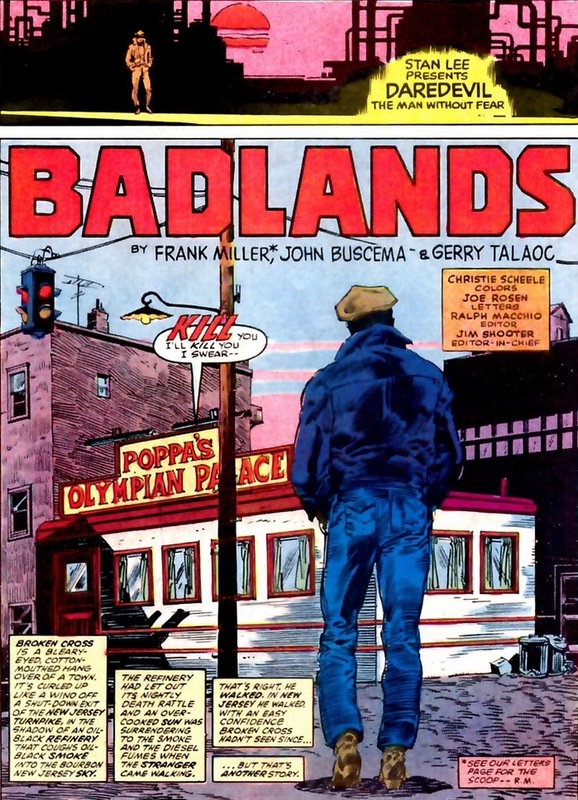 I assume Diggle wrote this as tribute to Miller and Buscema’s work, and it’ll be fun to compare the two. But we’ll cover “new school” Wednesday. 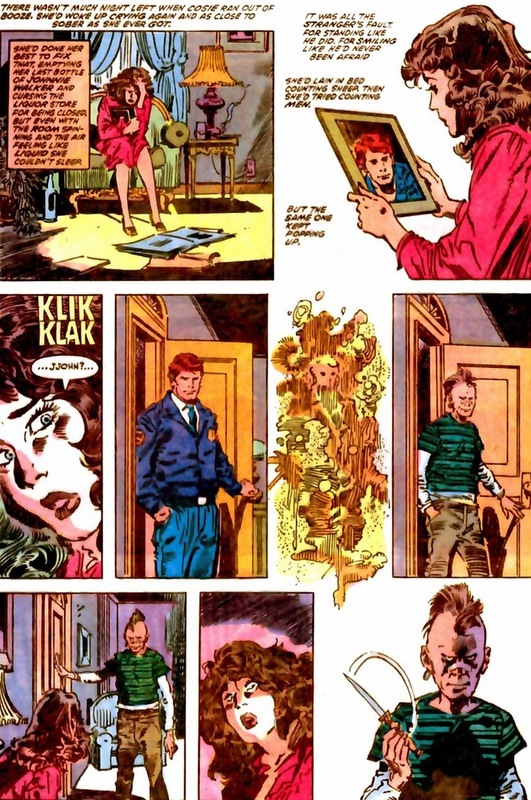 Now, if you do a quick Internet search, Daredevil #219 has been already analyzed and covered by far better writers than me, like The Matt Murdock Chronicles and Niel Jacoby. But regarding all my other comic blog buddies who have vast talent and passion — and you guys know who you are — I’ve learned that success comes in two ways: either do something that hasn’t been done before or be better than everyone else. Let me throw my hat in the ring; I’ll throw a few punches. Especially once I fix all that passive voice. Scooby Doo antics aside, small town corruption remains very real in the Marvel universe. To be fair, so does big city corruption, but the Avengers don’t park their jet on a helipad in Kansas. 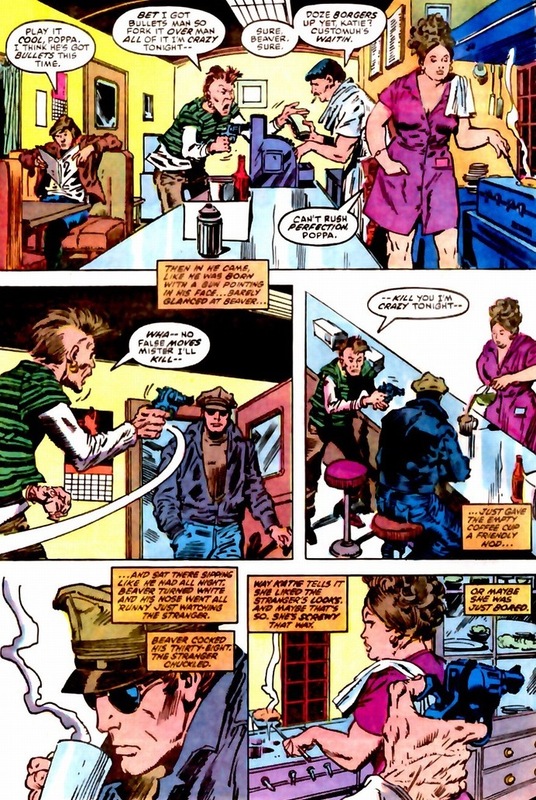 As we jump into the story, Matt Murdock (because Daredevil never shows up) does what normal superheroes do when they enter foreign territory undercover — they go to a local diner. 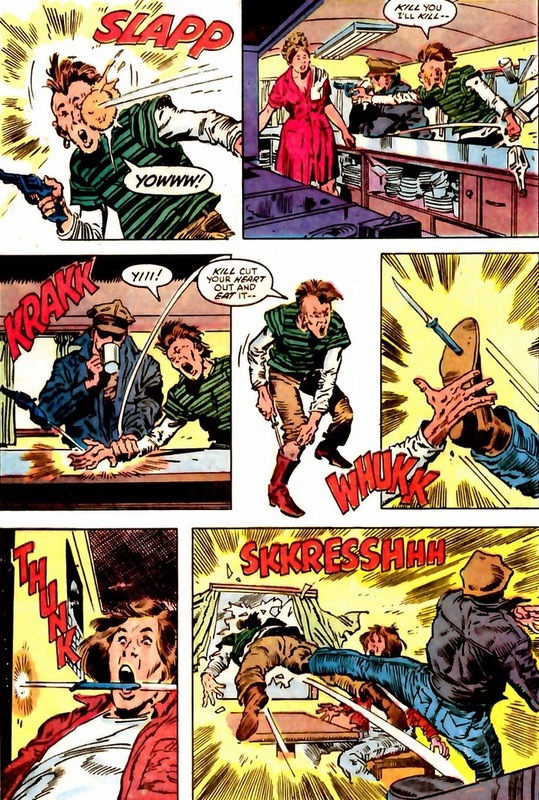 The Punisher alone has probably spent several waitress’ salaries worth of stale coffee and bad eggs. Notice the cool noir-style text boxes? 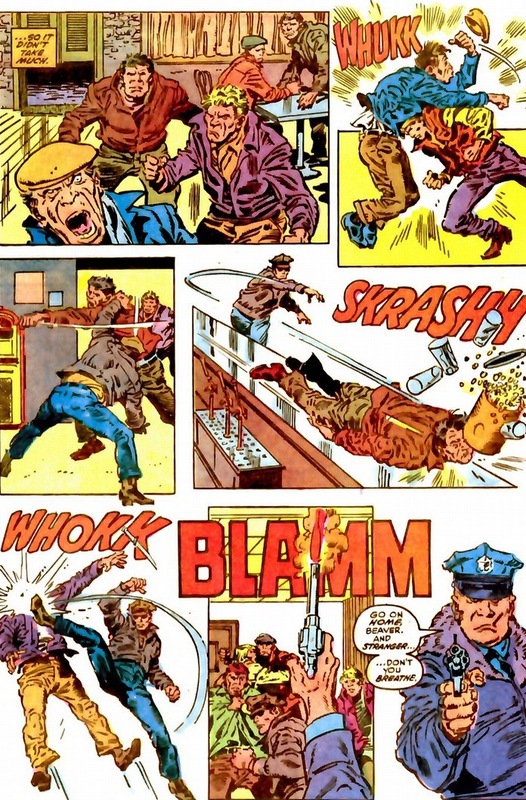 Y’see, the problem with committing crimes among a world inhabited by superheroes with secret identities is that they could be disguised as anything, like say a stranger wearing a fashionable peaked cap and leather jacket. 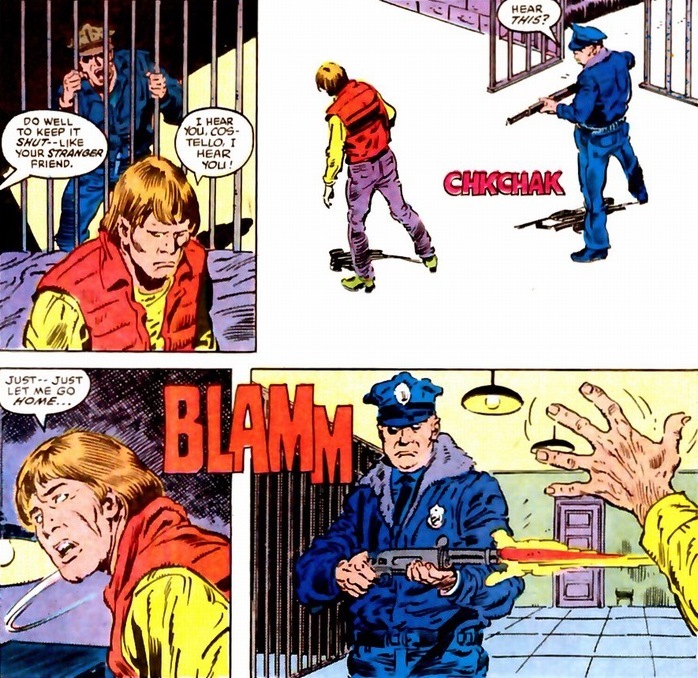 My favorite line so far: “Then in he came, like he was born with a gun pointing in his face.” If we ignore Murdock’s blindness, he still jump kicks dudes shooting bazookas and miniguns almost nightly. Of course a punk with a pistol won’t even register a single bead of sweat. That and he’s the Man Without Fear. But mainly the first reason. So a murder occurred recently, as you’ve noticed. A good man murdered for trying to correct the broken system. Murdock isn’t here to solve this problem. He doesn’t really solve anything. 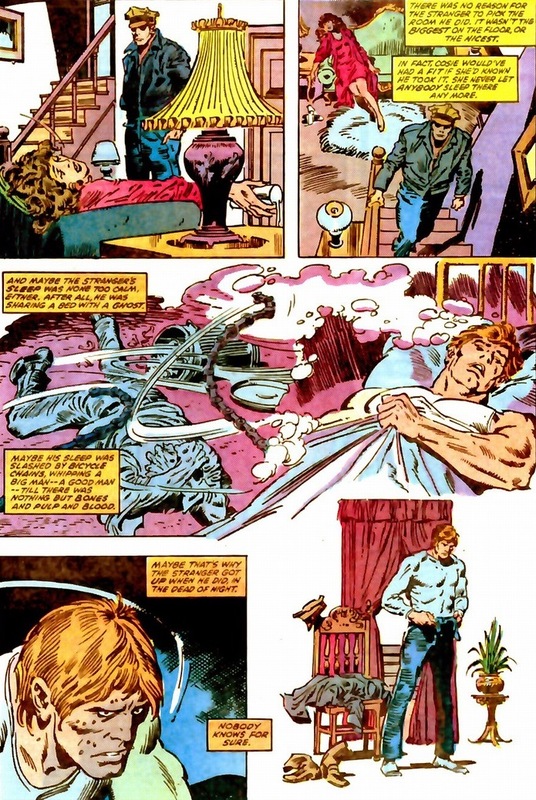 But we get to witness this small town collapse in on itself through Murdock’s eyes, regardless of his participation in the adventure. Especially when he meets that ego-bruised punk again. In that jail cell, we learn the truth behind the foggy door of immorality, which Miller excels at showing us tiny glimpses before ripping it off its hinges. 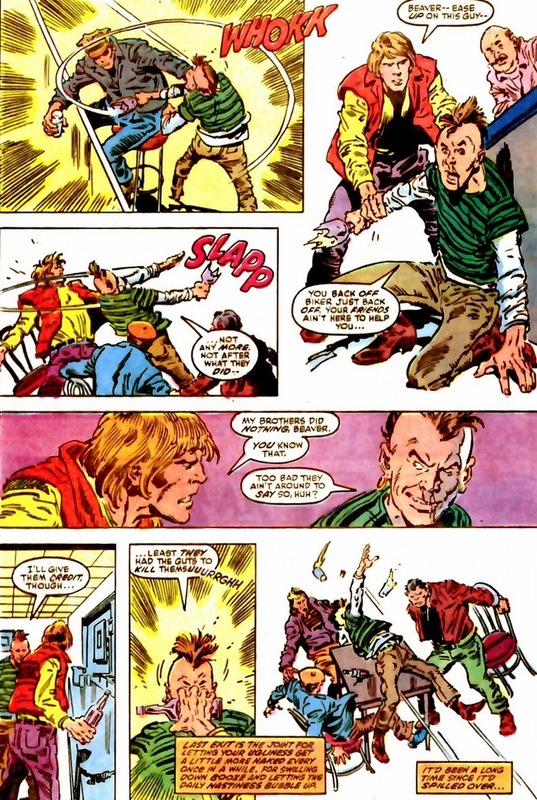 Good guys have a tough time in Miller’s (and Buscema’s) world. To save their home from itself, superheroes and other morally upright men and women tend to lose almost everything dear when Miller gets his hand on their lives. 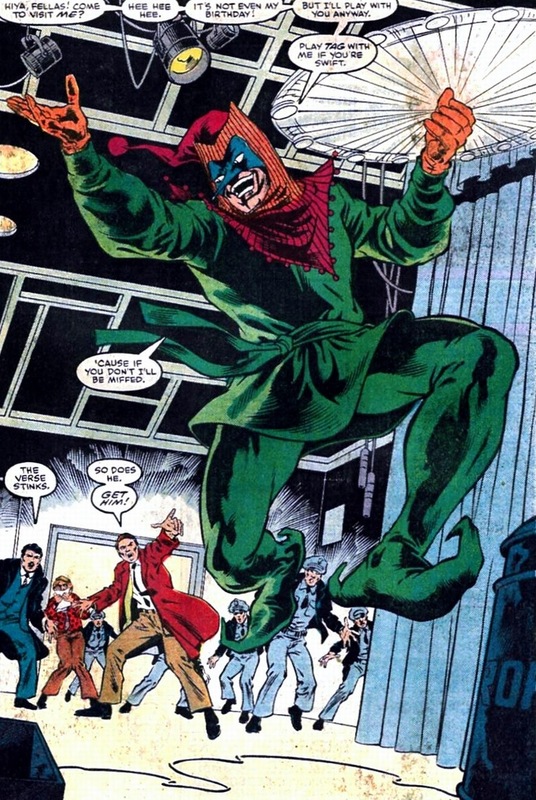 Until Miller grabbed control of the title, Daredevil couldn’t attain the level of success — almost to the verge of cancellation, being seen as just another costumed vigilante not as cool as Spider-Man or the X-Men. 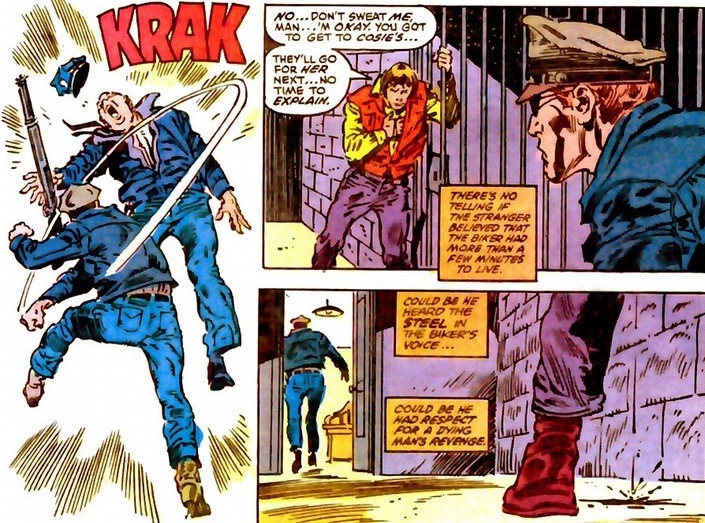 Daredevil retains his A-list Marvel status today because of Miller back in the 1980s, but oh my goodness did Miller wreck Murdock’s life. 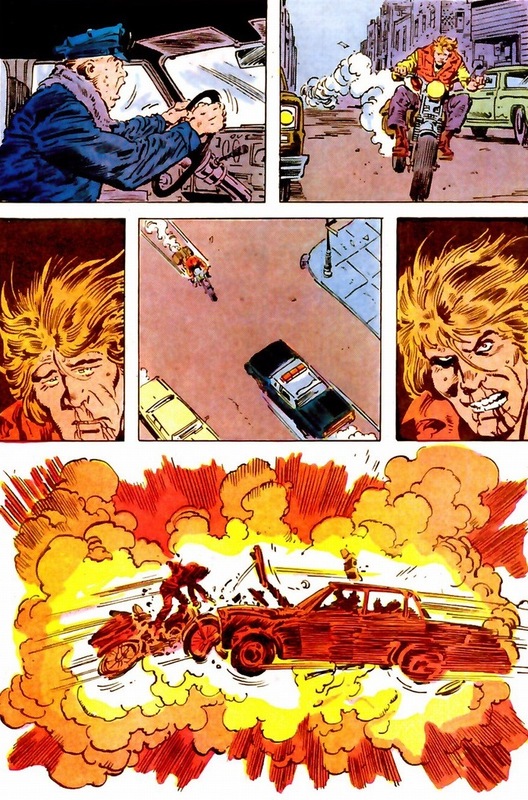 In a weird way, Miller saved Daredevil’s life by destroying it. Sort of. Oh, and now small town justice falls to the power of small town corruption. Our final acts ends with a bang. 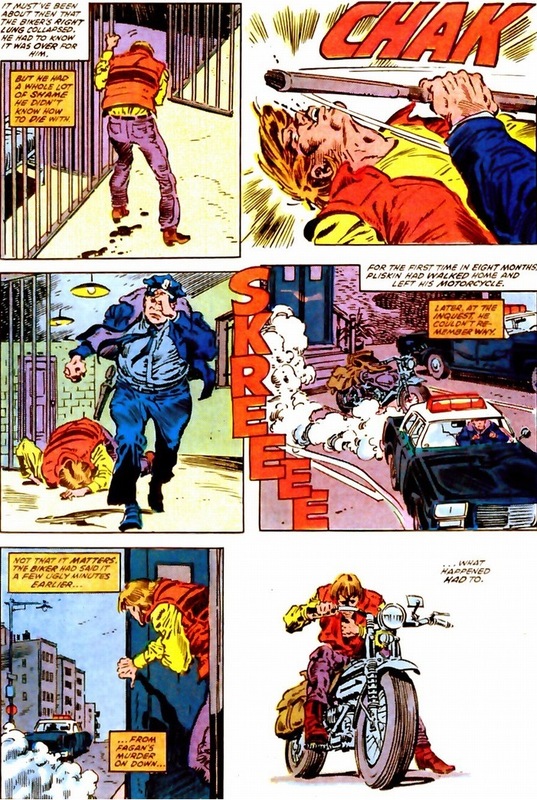 Because winning in 1980s Daredevil comics classifies as losing less than the other guy. If not physically than emotionally. Buy the issue (somewhere) for the full genius and all the fleshed out development I skipped over. 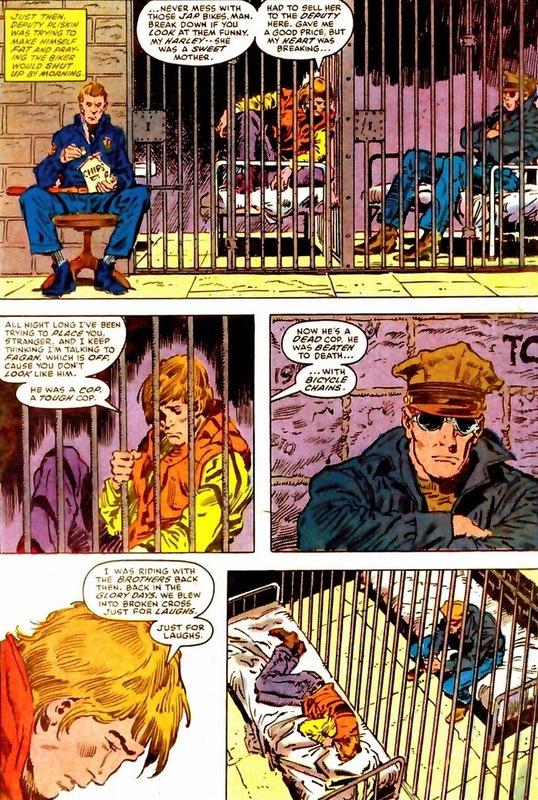 Remember this story on Wednesday for a modern day retelling in which Daredevil learned his lesson twenty years before about watching from the sidelines. Thank you for meeting my wishes and covering Daredevil # 219. I’m really glad that you enjoyed it as much as I did. I agree with you that the plot of this issue is so dense that no one could summarize all the subtle details that make it so special. One of the things I love most of this story is that all its characters, even the ones who appear only for 2 – 3 pages, play a key role and have a very well defined and intriguing personality. Only a very talented writer could have given so much deepness to all these characters despite having only 20 pages at his disposal. 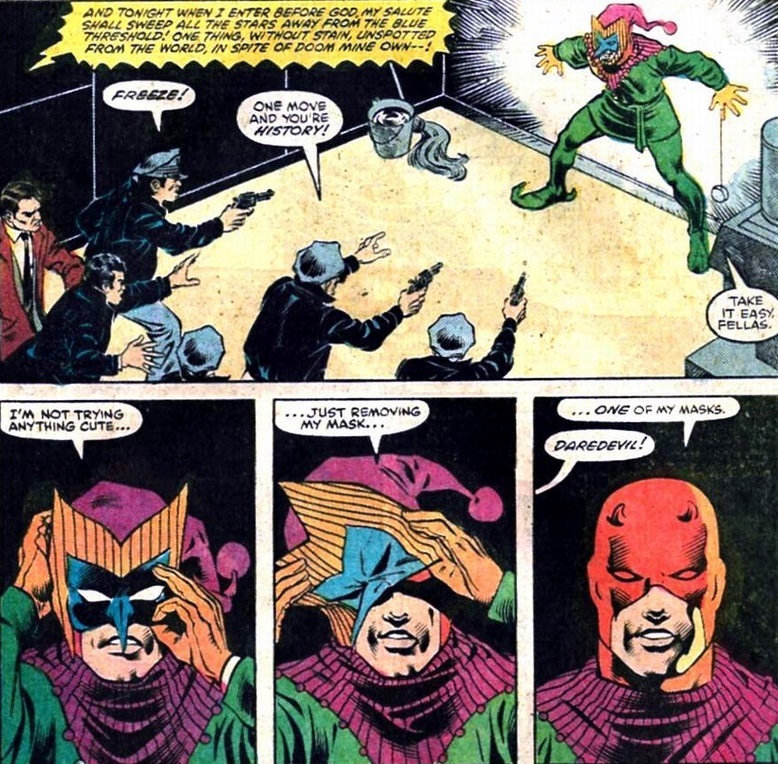 I also love how Miller dealt with the theme of justice. Cops are supposed to be just and fair, but, if a small town has only one of them and that single person is corrupted, the only way to obtain justice is the help of a foreigner. And when the foreigner comes, he doesn’t even have to work hard to bring Broken Cross some justice: all he has to do is being himself, that is to say being a honest and brave man in a place where these values died with Fagan. Matt’s example makes the good people around him thirsty for justice and the bad people frightened, until the conflict between the goods and the bads explodes. And at the end of this civil war, justice has been done, and nothing else matters.